Where to Stay in and around Bala, Gwynedd, North Wales. 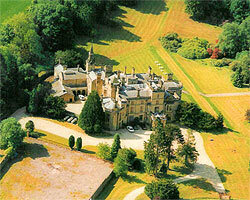 Our base for tutorials is in Bala itself, at the Plas Coch Hotel (see below) a two star AA rating. Where we hire the conference rooms specifically for internal training. We can arrange and book your accommodation. Bala has many more B&B,s but we have taken the care to ensure all properties advertised here are of a high standard and to suit every ones pocket, there are many campsites locally and caravan sites on the Banks of Lake Bala. TV an coffee making, all en-suite, facilities include choice of bars, and an A la Carte availability as well as bar meals. We have a special rate for groups which is £27.00 per person B&B. PLAS COCH HOTEL: AA 2 star. A focal point in this bustling town a former 18th century coaching inn is popular with residents and guests alike. And attractively appointed. Bedrooms are comfortable, All credit cards accepted. This enchanting Mansion house was built in 1870 and overlooks extensive grounds you enter through a fine entrance hall stained glass lantern ceiling and galleried Oak stairs the library bar, two elegant lounges and the smart dining room are a pleasure to the eye. The standard of cuisine is high and complemented by fine wines. The spacious bedrooms are luxurious with many thoughtful extras. Directions: Go off the B4401 Corwen/Bala road 4m from Llandrillo Llanderfel village over Bridge on River Dee first right and it is on your right about 600metres on right. No children accepted A La Carte. Room Price guide : single room from £69.00 to £120. Double Room, from £95 to £155. The Hotel is situated on the beats we would be fishing in Autumn for Salmon I took a 26lb fish , 14lb, and 10lb in 2 hours in 2002 below me the next pool took 2 fish also in that space of time and at certain times of the year September /October there are fish in all the pools as well as a good head of Sea trout. The Hotel is used for our Corporate Client Events and we can offer Game Shooting in Season and Clay pigeon all year round. This delightful Georgian house in landscaped grounds has been carefully & tastefully restored. 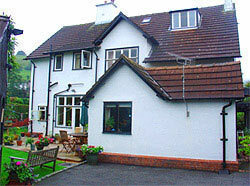 Comfortable accommodation in a peaceful, attractive location. Bedrooms are comfortable and spacious, Accomplished food served in the elegant restaurant. The hotel provides an ideal base for many activities and a perfect base for your fishing course. Directions: on the B4401, Corwen-Bala road.